Near our side door entrance I have created a small vignette. My rain boots got a coat of red spray paint, and I cut the vinyl snowflakes with my Silhouette machine. How cute are they now? I can still wear them, and I love there new look. Atop the old apple crate sits a vintage pool basket filled with 2 mini pine trees. 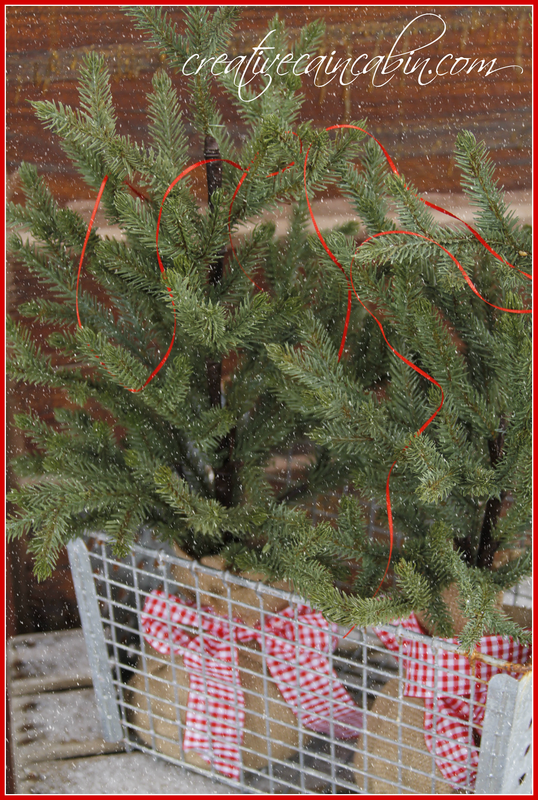 The base of the trees are wrapped in burlap and tied with a gingham ribbon. For a little color a skinny strand of red ribbon is draped across the branches. We are even getting snow right now, so it makes it all more fitting. So adorable. I love garden boots too and have them in the garden in the summer but through out my house in the winter too. Very cute. HI Dawn! Oh, you’re so good! I love this and those little boots look adorable and I would have thought you bought them looking just like that! Oh, and you’re getting snow! Thank you so much for popping in to see me. I wis you and your family a wonderful Merry Christmas. How pretty and cute boots. Yall got snow,I’m green with jealousy…ENJOY! I’ve enjoyed blogging with you this year,it’s been ton of fun! I absolutely love your red boots and all the gingham touches. Your front porch hails the biggest WELCOME! Blessings and enjoy that beautiful snow! Aren’t you lucky to have snow. Looks so festive and pretty. Great idea to paint your boots. I painted shoes for Halloween several years ago and they look so good still. Merry Christmas! The boots are adorable!! 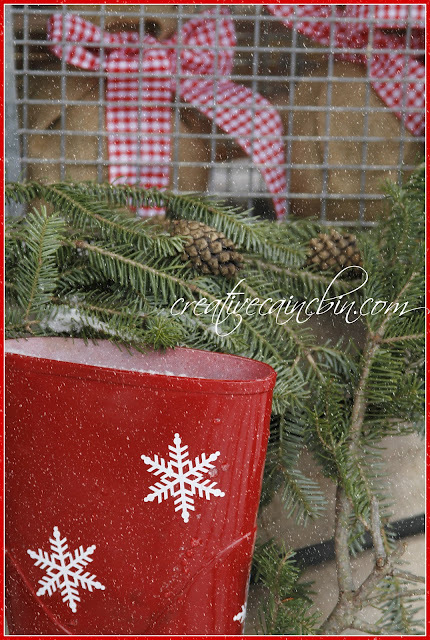 I also love the trees stuck in the pool basket, with that skinny red ribbon. Too cute! 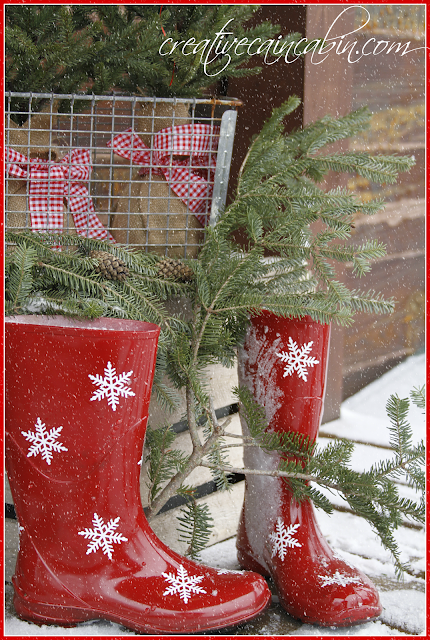 Now I want a cute, little pair of red boots on my porch! Next year for sure! Oh my goodness, those boots are so darn cute!!! I love it Dawn. I have never cut vinyl with my siloette and will have to give that a try in the New Year. Have a a wonderful, white Christmas! I love what you did with your boots. get some snow? I hope so! girl these are way too cute. I did some of these last spring, and I still love them. I never wore mine out though:) Merry Christmas to you and your family Dawn. Oh my…these boots are just so CUTE!!! Merry Christmas to YOU! GET OUT OF THE CITY!!! Those are to die for cute! I am painting mine!!! Now, if only I had a silhouette!!! Oh, how clever you are, Dawn! 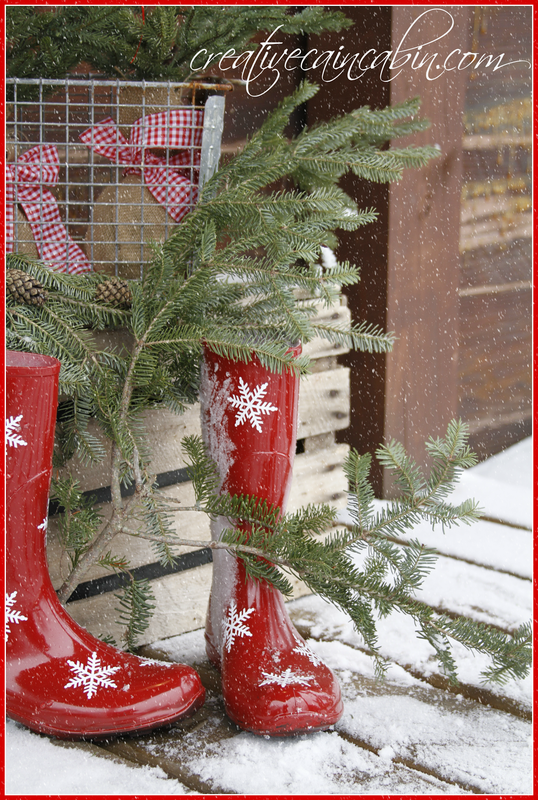 The rain boots are just adorable, and the crate with the greenery just sets the scene. 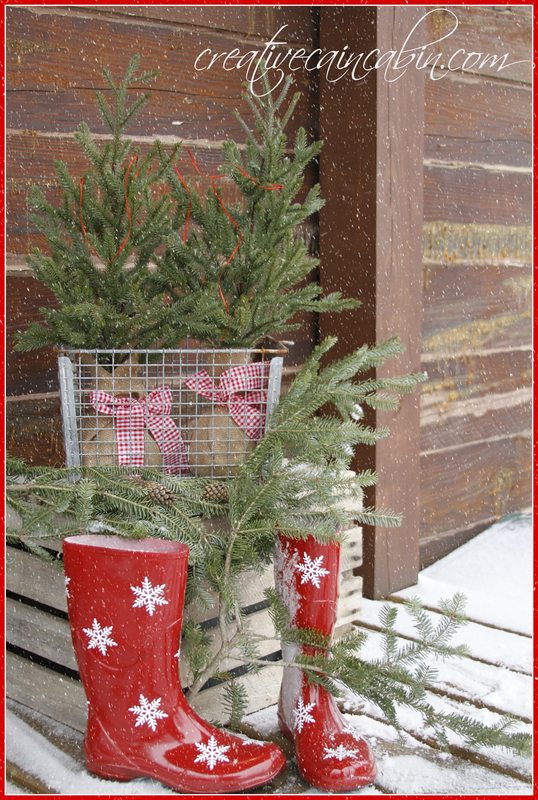 How nice of Mother Nature to add snow to complete your front porch vignette! Beautiful! Those are the cutest boots! I am a new follower! I’d love you to come link up at my Pin Me Linky Party.